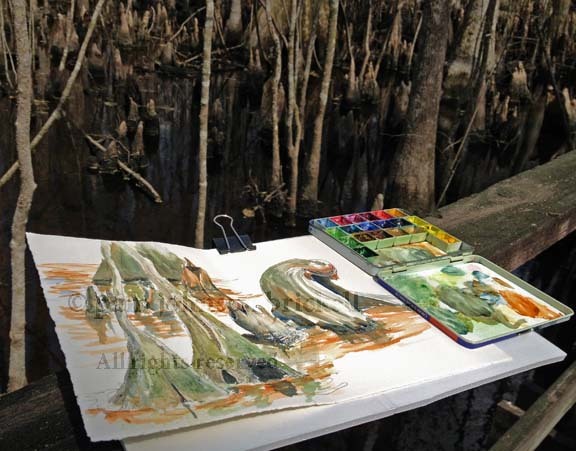 The Audubon Sanctuary of Beidler Forest is located in the town of Harleyville, SC, and sits in the middle of the very large Four Holes Swamp. I was first introduced to this amazing place during a 2008 field trip of the Master Naturalist Program I was enrolled in. I've always wanted to return and take my time to sketch the beauty of this natural treasure. I began to wonder if I brought enough paper with me :) Rob was beginning to wonder if we'd ever make it out of the swamp! There were a few other folks enjoying the boardwalk. Everyone was very giving with information about a special sight... which included two sunning Rat Snakes, a flock of White Ibis and best of all, one of the swamp's Barred Owls that was perched in a tree very close to the boardwalk! That was the last thing I sketched on the page during our walk. I added the lettering while we sat on a bench outside of the gift shop, and returned home with the journal page mostly completed. What could I put in the upper right corner that would highlight the owl but not take away from the rest of the page? The next day, while perusing Beidler Forest's website, I came upon the perfect thing. A map of the boardwalk from their Trail Guide. I was thrilled to find it, as I had to return the copy we used on our walk. Do check out their site. For even more fun.... visit their blog. This looks like a lovely spot to capture nature...your watercolor and pen sketches are very lovely...great idea to use the map to set it off. Thanks for sharing. Thank you for stopping by, Debbie, and your encouragement! Yes, if you ever find your way to SC and are near Columbia... do make a point to visit Beidler Forest. You won't be disappointed! Your wonderful journal page and story make me want to visit there! It is only a 2 hour drive to Columbia for me...hopefully I can get there one day soon. Thanks for their Blog link! I am participating in the Georgia Master Naturalist Certification Program right now. We are having awesome nature experiences, and I look forward to every Thursday! Thanks, Debo!! Congrats on taking the MN program. Ours was 12 weeks long and jammed with so much great info and field trips! You will love it at Beidler. It's a 200 mile trip for me and is south of where 26 intersects with 95. Call and ask about bugs before you go. There are times when the mosquitoes will carry you off. We didn't have any bug issues, nor can I remember any in early April during my first trip. Wonderful layout - I really liked the bent old woman in the cloak and the addition of the little owl. Sounds like a wonderful place to visit! Thanks, Rhonda! Yes, it's truly a treasure to visit! What a beautiful commentary, with lovely images! I work at Beidler and love to hear how others are as thrilled as I am to be able to experience its serenity and natural beauty. 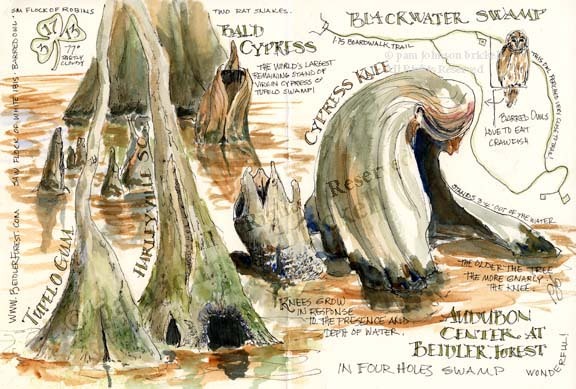 The large cypress knee you sketched is one that I call "The Madonna," because when the water is lower, it seems like she's looking down into her cradling arms. Because the water moves, we usually don't have a mosquito problem, but it can happen occasionally in July or August after heavy rains leave standing water in low spots. Even then, I still love going out into the swamp to refresh my outlook on life! So glad you enjoyed it! I love your line "going out into the swamp to refresh my outlook on life!" It surely would bring things into perspective. How easily we humans can get swept away from our 'natural' roots. Thankfully, there are powers to be that realize the importance of protecting treasures like Beidler... I try, in my small way, to create art that attracts folks to take a closer look at their environment... And, offer journaling workshops, as I find when you sketch nature, environmental ownership and 'nature love' sinks into your soul. It's all about stewardship.... yes?